Octave, Vibe and Fuzz effects in one unit. Captain Coconut brought together three of the most sought-after effects in one easy to use, reliable and great sounding box. All faithful reproductions of vintage effect circuitry, fine-tuned for the best sounds and added flexibility. Octave effect - Classic octave doubler fuzz. Get that "Purple Haze," "One Rainy Wish" upper octave effect. Earthy, flutey tone. Just like the Tycobrahe Octavia. Provibe effect - Original vibe effect. Lush 3-D phasing chorus effect for that "Machine Gun", "Bridge of Sighs" swishy vibe sound. Center control allows you to dial in all the greatest vibe tones. Switch selects between CHORUS and VIBRATO modes. Just like the Univibe. FuzzFoot effect - Classic British Germanium PNP circuit with some much needed improvements. Sounds great with wah wah pedal. Get all the greatest fuzz sounds with GRIT knob for variable sputter. Cleans up great with guitar volume knob. Ultimate version of classic FuzzFace effect. Full signal patching provisions - insert effects, change order, etc. Provibe has additional feature - Center control for fine-tuning the balance of the sweep. FuzzFoot has additional feature - GRIT control for fine-tuning the amount of classic "Fuzzface sputter"
DIMENSIONS: L=8.7" W=5.7" x H=2.2" Add another 1.5" to the overall height for the Rubber feet and the Knobs & switches. Leave 2 - 3 inches in the back for plugs. 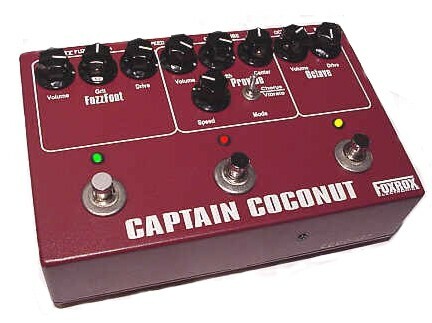 Need an owner's manual for an original Captain Coconut? Click here to download a PDF.